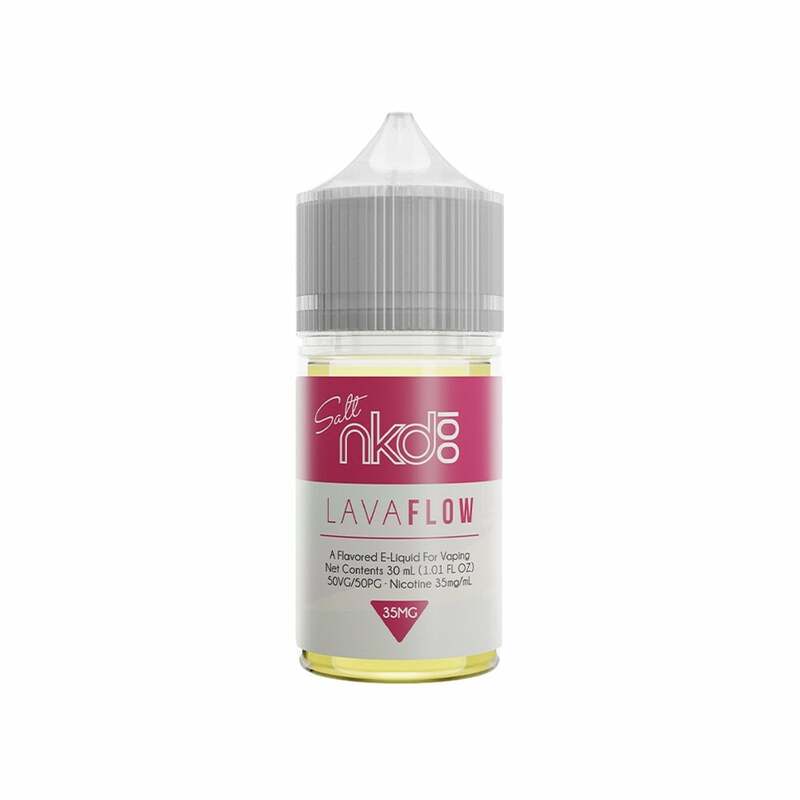 Lava Flow, from the nkd 100 Salt line of Naked 100, is a delicious fruity vaping experience. The Lava Flow taste is a mix of fruity sweetness and real fruit flavors. A perfect combination of strawberries, refreshing and clean coconut and sweet pineapple. Put this in any refillable pod mod, like the Suorin Air or Suorin Drop, and enjoy the tropical deliciousness and satisfaction of Lava Flow with nic salts. This is by far my favorite NKD 100 Salt Nic. It's very sweet and fruity. Strawberry is definitely the star of this flavor profile. If you don't like sweet e-juices then it's probably not for you but everyone else - YOU WILL LOVE IT! Don't think twice about trying this one -- it's good....really good. By far my favorite flavor. Works great with my suorin drop and air. I really like it. It’s smooth, not too harsh, will definitely buy again and try other flavors from this brand. Good Taste, Think I like the other nkd 100 salt flavors better as they have a stronger throat hit and menthol. I didn’t care for this flavor. I wouldn’t buy again. Not my favorite in their line but decent. Subtle pineapple flavor. This juice was bad from the first pull. I don’t recommend for use in Juuls, as it leaked a lot. The flavor got really boring after a few days. Don’t recommend for more than occasional use. 25th November 2018 - Sydney R.
I hear this is one of the best selling juices of all time i made the mistake and bout it in (slt nic) 35mg. Instead of reg-6mg. Im not a fan of this i feel lile the fruiter the flavor the more it need to be vaped in Low mg.
Ill try it again in low mg when i run out of it. Quickly shipped and I like the flavor. It's okay, but I've been through only half of my bottle and I'm sick of it. If you like pineapple, you will definitely like it. The pineapple is very strong over the other flavors. It begins to taste differently after you've vaped it for a while and at this point, I'm done with it. Not an every day juice in my opinion. For me the pineapple flavor was too much and thats all i really tasted. it was smooth but to many flavors going on. Absolutely love this flavor! Seems to be not be too harsh but still packs a punch. Flavor is just about perfect in my opinion! This juice is pretty strong, but has a good taste. I would buy again. Good alternative juice if you don't want to keep buying pods. Definitely, one of the top nic salt juices I have had. Very harsh! I guess I really don't understand what the craze is about nic salts. I use lava flow 6 MG in my pod system and it's great. I figured I would try the nic salt version which is recommended for pod kits. It's so harsh and makes me cough. I really don't understand what the craze is about. I got the low nic 25 MG I think? The flavor is way off as well. Maybe it's just me. But I will stick to the original! Lavo Flow Salt Nic juice is amazing in a sourin or Juul. Any pod mod really it works best with. But the first few times u hit it, it’s kind of harsh and weird because of the salt Nic. But after a bit once you develop a tolerance to the juice it’s dank. Another top dollar salt Nic juice would have to be the Propaganda Salts Blue slushy 50ml juice. This juice is truly amazing in a pod mod. It rips so smooth, yet still has a harshness at the very end of the hit like a Juul. But it’s not harsh, it just gives you a fat buzz. But it’s a perfect 50ml Nic bottle, so it’s dank. I think you need balance two favorite flavors minimum to keep loving both. This is one of my pair. I adore this flavor. Very bright and yummy.